I recently had the opportunity to interview Cecile Smith, owner of Piper Farm and co-breeder of Australian champion and 10-time group I winner So You Think (NZ) (TrueNicks). Cecile owns So You Think's dam, the 22-year-old Tights mare Triassic, who is currently in foal to Medaglia d'Oro (TrueNicks,SRO) and is carrying a colt. Cecile uses TrueNicks reports to supplement her stallion research, but as you'll read, making the final stallion selection is a challenging process. Ian Tapp: What type of mare is Triassic? Cecile Smith: Well, from a completely biased point of view, she is gorgeous! She is a big (16-2) handsome bay mare with the most "schmoozy" personality you could ever hope to have in a broodmare. Her paddock name is Large Marge. She has a propensity to snooze in the paddock which sends everyone in the neighbourhood to their telephones to tell me that Triassic is down. After racing to her paddock and waking her up, she looks at me as if to say, "What???" She is an absolute darling. 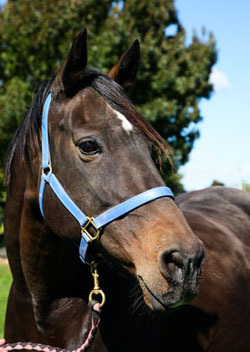 Will Triassic be bred in 2012, and if so, to which stallion? To be honest, at this point I haven't got a clue who the next stallion for her will be. That sounds somewhat remiss of me, I know, but firstly, we need to get her through this next foaling safely. And, if the vet says she is capable of carrying another foal, we will then get serious about her next mating. I have lots of input from friends and neighbours and EVERYONE has an opinion. As you know, Triassic went from being just another old, non-commercial broodmare to one of the Southern Hemisphere's most important mares. I got her in my property settlement when my husband, Alex, and I separated. My problem is that it is difficult to see her any other way except my lovely old girl. She is a pure pet. As I am a relatively private person, I find the attention uncomfortable, and no matter what decision I make for her, it will not satisfy everyone and it will be commented on publicly. What are the factors involved in your stallion selection process? Because we have never had well-bred mares, breeding has always been a balance between pedigree and type of stallion. In the beginning, we got sucked into the hype of the studs' marketing managers and over-bred our mares to expensive stallions. But, like everything, you learn from your mistakes. We began to take the advice of more experienced breeders and look at the physical type of stallion that would go with our mares. (The largest number of mares that Piper Farm had at one time was four). My neighbours are wonderful, knowledgeable horse people who look out for me. I am the first to admit that I know practically nothing about horses except that I have loved them since childhood. For the record, I have one broodmare and an eight acre farm...not exactly the profile of a commercial breeder. One neighbour in particular was invaluable in helping us choose stallions for the mares and that was Brian Jenkins, the winning trainer of the 1998 Melbourne Cup with his big mare, Jezabeel. [Jenkins also trained Triassic.] He suggested that we use Shinko King, a much under-rated stallion here, for our old K3 mare, La Magnifique. That mating produced C'Est La Guerre, the group I New Zealand Derby winner and 3rd placegetter in the 2009 Melbourne Cup. It was Brian who also suggested to us and our co-breeder of So You Think, Mike Moran, that we use High Chaparral for Triassic in 2005. Because Triassic is a big masculine mare, Brian felt that High Chaparral would give her foal more refinement. And voila! So You Think was the result. With Triassic being such a significant mare now, and with her age (22 in August), finding the right mate for her is crucial. New Zealand is limited in the number of commercial stallions that would be suitable for her. If she were in Australia, this would not be a problem but because of her advanced age, I would not risk sending her to Australia again. It was a risk sending her to Darley for the mating with Medaglio d'Oro at her age then but all worked out well. The care and attention that Darley and the agistment farm that she stayed at was outstanding. It was suggested that I leave her in Australia and, in truth, that would have been the commercial thing to do. But, as I said earlier, she is a pet and I would have missed her terribly. So, in the end, I brought her home, in foal, back to NZ and Piper Farm. As mentioned earlier, the number of suitable stallions is causing a dilemma for me. Some people say that it would be a great dilemma to have. I can assure you it isn't. I have been to-and-fro-ing between different stallions for as many different reasons. There are commercial stallions. There are stallions that match her pedigree perfectly. There are stallions that would complement her physically. Then, there is the age factor of the stallion. What is the stallion's fertility like? Is it a proven stallion or is the stallion just starting his stud career? And on and on. Truly, it has taken over my brain! However, all this angst may come to naught if the mare is not able to carry another foal. Her foaling date is mid-September and we will find out the answer to that question then. One step at a time.